Home News Netherlands: Broncos 1st away game win! Netherlands: Broncos 1st away game win! 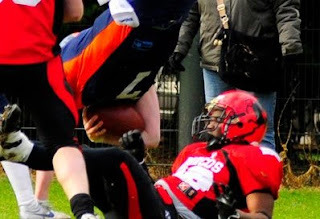 On Sunday March 17th, the Enschede Broncos went on their first away game of the season against the Eindhoven Raptors. Two weeks ago, the Broncos won with the score 22-06 at home vs the Raptors. The weather was great and the Broncos Defense even better. Forcing three and outs while the Offense was getting off to a good start. Scoring the first TD in their second drive, including a Two Point Conversion, set the score to 08-00 right away. Good for 65% completion rate, two TD passes and a rushing TD on a QB sneak - Quarterback Tom Wolterink had a good grip on the Raptors Defense. The halftime was reached with a comfortable 08-20 lead for the Broncos. Getting back into the game - the third quarter was relatively slow, no points on both sides, however in the last one the Broncos reached the Endzone of their host twice, setting the final score on 08-32. The first ever “on the road” win was a fact. In two weeks the Enschede Broncos are going on the road again, to Almere Flevo Phantoms. Earlier this season the teams met with a 18-00 win for the Broncos, off course they want to keep up the winning streak being 3-0 and looking for a play-off spot.